Auglaize County Commissioner Don Regula, left, and Wapakoneta Area Economic Development Council Executive Director Greg Myers took part in a conference call Thursday with Mattias Breier, president and chief executive officer of the Transatlantic Business Investment Council, based in Berlin, Germany. The call was to formally announce the recent certification of Auglaize County as one of five certified Foreign Direct Investment-Qualified communities in the United States. 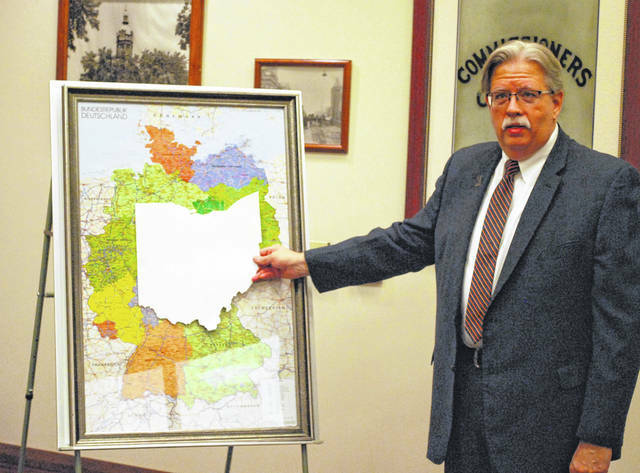 Gregory Myers, executive director of the Wapakoneta Area Economic Development Council, illustrated the size of Ohio as compared to Germany during a press conference Thursday to announce a partnership with the Berlin-based Transatlantic Business Investment Council. WAPAKONETA — In the entire United States of America, there are five communities — just one of which is located north of the Mason-Dixon line — that are squarely on the radar of an international marketing and site-seeking consulting firm that seeks to match international investors with prime potential industrial sites. The lone community in the northern half of the U.S. is known, quite simply, as Auglaize County, Ohio. Through a partnership with the Transatlantic Business Investment Council, Auglaize County officials recently completed the necessary training and obtained certification as the TBIC’s first Foreign Direct Investment-qualified community in Ohio. The TBIC, headquartered in Berlin, Germany, seeks to bridge the gap between U.S. economic development organizations and European investors searching for a location for projects in the United States. 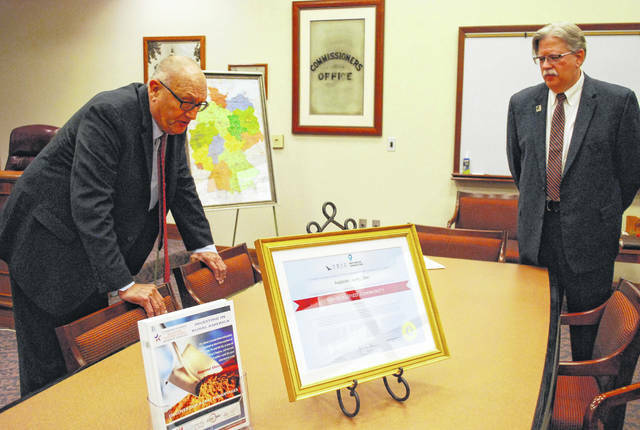 The new certification was celebrated on Thursday when Matthias Beier, president and chief executive officer of the TBIC, took part in a conference call with county commissioners and economic development officials from throughout Auglaize County. Beier, calling from Berlin, congratulated his new Ohio friends for their efforts in putting Auglaize County on the global economic development map. The new alliance “means new jobs, better jobs and well-paid jobs” could be coming to northwest Ohio in the not-too-distant future, said Beier, calling the TBIC a “platform for international investors” seeking to expand into the U.S.
Other TBIC-certified communities in the U.S. are in Alabama, Georgia and Texas (two). According to Gregory Myers, executive director of the Wapakoneta Area Economic Development Council, Auglaize County commissioners put up the approximately $9,000 necessary to achieve the scrutiny, evaluation and training necessary to gain TBIC certification. Myers said officials participated in a certification program during which a three-person team from TBIC and Navigator Consulting, an international consulting firm, spent three days in Auglaize County reviewing the area’s business location assets for international investors. The process also included a detailed community survey and site assessment, along with leadership training. County Commission President Don Regula said the money is an investment in the future.